LAST DAY OF ANALOG UPDATE: The end of the digital conversion is wrapping up with about as much confusion as the rest of the process, with some last-minute additions (under heavy FCC pressure) to the "nightlight" list and many changes to scheduled shutdown times to comply with FCC rules about call-center hours and such. In Buffalo, WGRZ (Channel 2) will go nightlight rather than going dark on Friday at 1 PM, with its nightlight authority extending through June 27. WNYO-TV (Channel 49), meanwhile, has been granted a CP to put WNYO-DT on channel 49 come Friday, and will make that switch at 11 AM. In Rochester, WXXI-TV (Channel 21) will go to nightlight at 8 AM. In Syracuse, WSTM-DT's move to channel 24 has apparently been delayed, so when WSTM-TV leaves channel 3 at 12:01 AM Friday, Syracuse will have no over-the-air NBC or CW until sometime Sunday. WTVH (Channel 5) goes off at 9 AM, while WSYR-TV (Channel 9) goes off at 12:01 AM and WCNY-TV (Channel 24) at 1 AM. Watertown's WWTI (Channel 50) goes off at 11:59 PM Friday; there's still no word about Albany sign-off times. WNYW-TV (Channel 5) and WWOR (Channel 9) plan to stay on until 11:59 PM, as will WXTV (Channel 41). In Hartford, add WFSB (Channel 3) to the nightlight list; it will stay on in analog until June 26. In Boston, the flips to nightlight start at 11:59 AM (WGBH-TV 2), followed at 12:30 PM by WBZ-TV (4) and at 12:59 PM by WCVB (5). WSBK (Channel 38) signs off at 1 PM, and WLVI (Channel 56) and WHDH-TV (Channel 7) hang on until 11:59 PM. In Portland, WCSH (Channel 6) is a late addition to the nightlight list, operating through June 27. In Pittsburgh, KDKA-TV (Channel 2) and WTAE (Channel 4) will both go nightlight Friday. In Philadelphia, KYW-TV (Channel 3) goes nightlight at 12:30 PM, when sister station WPSG (Channel 57) goes off. Most of the market's other remaining stations sign off between noon and 2 PM, we're told. *It's been more than a decade in the making, turned into a political football and delayed repeatedly, but starting late this Thursday night, one of the biggest transitions in the history of U.S. broadcasting will finally come to fruition, as the remaining full-power analog TV signals begin to blink off all across the country, with the last of them going dark at the stroke of midnight late Friday night. According to a list released last week by the FCC, some three dozen small stations around the country won't be coming along for the ride, at least not right away. Those stations will still have to turn off their analog signals by the June 12 deadline, but because their DTV signals aren't up and running - either for financial or technical reasons - they'll be off the air completely, at least temporarily. Upstate, there are two stations in somewhat more dire straits. Syracuse-market WNYI, licensed to Ithaca, and Buffalo-market WNGS, licensed to Springville, have no digital signals ready to go come Friday. Both stations were part of the now-bankrupt Equity Communications, which was running Univision programming on WNYI and had most recently been carrying the new "This TV" service on WNGS. But the June 12 sunset of analog TV will start the clock running for Daystar TV, which has agreed to purchase both WNYI and WNGS from Equity's bankruptcy trustee. Whenever the deal closes, Daystar will only have until July 11, 2010 to get digital signals (on channel 20 for WNYI, channel 7 for WNGS) built and operating. *After years of struggling to break out of its longtime role as an also-ran in the Binghamton market, Newport Television's WIVT (Channel 34)/WBGH-CA (Channel 20) has effectively thrown in the towel on local news, leaving broadcast viewers in Binghamton with just one full-time local news option. On Friday afternoon, Newport announced that it was replacing WIVT's local newscasts, which were already limited to a morning show, a 5:30-6:30 PM hour and a short update at 11 PM, with simulcasts of the news from sister station WETM (Channel 18) in Elmira, 50 miles (and a separate TV market) to the west. Eleven employees, including veteran anchor Steve Craig, lost their jobs, and the WIVT newsroom at the Oakdale Mall in Johnson City will be closed, leaving only a skeleton staff (including, for now, anchor Peter Quinn and news director Jim Ehmke) back at WIVT's studio/transmitter facility on Ingraham Hill. Some history here: Channel 34, an also-ran in local news through most of its existence as WBJA and WMGC, dramatically expanded the size and professionalism of its news operation in the late 1990s, seeking to capitalize on the flip of the market's longtime number-two station, NBC affiliate WICZ (Channel 40), to Fox. While WICZ cut its news presence back to a daily half-hour at 10 PM, new owner Ackerley expanded WIVT's newscasts to mornings and beefed up its staffing for evenings, and for a time WIVT challenged perennial market dominator WBNG (Channel 12) in the quality of its coverage, if not in ratings or revenue. Through all those years, though, channel 34 has always provided at least some semblance of a local Binghamton newscast - right up until 6 o'clock last Friday evening, when whatever Binghamton viewers were still looking for local news on WIVT or WBGH saw WETM's news from Elmira, a newscast that station says will continue to be focused on the Elmira market - "Chemung, Steuben and Schuyler counties in New York and Tioga County, Pa," according to WETM general manager Randy Reid. WIVT's exit from the news scene leaves WBNG as the only local news in mornings, middays and early evenings, with WICZ's 10 PM newscast largely a non-factor in the market. Even with Time Warner's News 10 Now providing some competition for viewers in this heavily-cabled market, it's still a disturbingly small amount of choice for local news, putting Binghamton into the same "one-newsroom city" category as nearby Utica and Watertown, and we're sorry to see it happen. *One more Binghamton note: the broadcast newsroom that did shine with its coverage of the April shootings was a radio newsroom, Citadel's WNBF (1290) - and the newsroom's hard-working star of the day, veteran reporter/anchor Bob Joseph, will be honored (and deservingly so) with a special achievement award at the Binghamton Broadcasters Reunion in September. In Albany, Newport is growing its news product, adding an 11 PM newscast to its existing hour-long 10 PM news on Fox affiliate WXXA (Channel 23), beginning June 29. But those Newport employees there - and at the company's other stations in Syracuse, Rochester, Watertown and Harrisburg - will be working a little harder for less, since the company is also imposing mandatory unpaid two-week furloughs as it tries to make up for what it says are severe revenue declines across the board. *Back to radio: There's a rare opening for a night jock at New York's Z100 (WHTZ 100.3 Newark NJ), now that Billy the Kidd is returning to Dallas for what are described as "family reasons." He'd been tracking his show for Dallas' KHKS from New York, and he'll track the night show for Z100 from Dallas until a replacement is named. Down the street at Emmis' WRXP (101.9), Matt Pinfield is back in the morning-drive chair after taking a month off for rehab for substance abuse. Scranton's Shamrock Broadcasting has moved its new 107.1 construction permit from Livingston Manor to Hancock, New York - and now it has new calls, too, as "WJZI" becomes "WBZX." Suppose it's going to be a simulcast of "Rock 107" WEZX in Scranton? Here in Rochester, we're told that the last of the Clear Channel stations left the cluster's longtime home in now-completely-vacant Midtown Plaza last week, with the entire cluster now settling in across Chestnut Street at the HSBC Plaza building that used to house CBS Radio, and then the Stephens Media stations. Former WRRV (92.7 Middletown)/WRRB (96.9 Poughkeepsie) morning co-host Jennifer Coudrey has died. Coudrey, then known as Jen King, co-hosted "Music all Morning with Boris and Jen" from 2001-2004, then left the station to become a physical therapist. While at WRRV, she was diagnosed with a form of cancer known as soft-tissue sarcoma, the disease which claimed her life on May 29. One more belated obituary: Al Racco, who died May 20 at age 80, moved up within the ABC Radio executive ranks to become vice president and general manager of WABC (770) in 1975, presiding over the station's last years as "Musicradio 77" and the controversial - but ultimately very successful - transition to talk in 1982. DTV Status Update: Only one New York TV market, Watertown, had substantially ended analog broadcasting back in February, leaving just ABC affiliate WWTI (Channel 50) on the air through Friday. Utica followed suit in March, when WUTR (Channel 20) and WFXV (Channel 33) shut off their analog signals, leaving the market all-digital. In Elmira, WENY-TV (Channel 36) ended its analog broadcasts May 30, flash-cutting to digital on channel 36. (The new WENY-DT offers ABC on 36.1 and CBS on 36.2, the first time that network has had over-the-air coverage in Elmira.) In Binghamton, only ABC affiliate WIVT (Channel 34) and PBS outlet WSKG (Channel 46) are sticking it out through the end. In the state's bigger markets, though, most major stations have kept analog going until the very end. In Buffalo, WIVB (Channel 4) and WNLO (Channel 23) will sign off at 9 AM Friday, followed at 1 PM by WGRZ (Channel 2) and at some point in the day by WKBW (Channel 7) and WPXJ (Channel 51). WNYO-TV (Channel 49) will run right up till midnight on Friday; it's hoping the FCC grants it last-minute approval to go digital on channel 49 instead of continuing on its weaker channel 34 DTV allotment. In Syracuse, WSTM-DT (Channel 54) goes off the air tomorrow so that its transmitter can be modified to operate on channel 24, once WCNY's analog signal vacates that channel Friday. It's not yet clear when WTVH (Channel 5) or WSYR-TV (Channel 9) will pull the plug on their analog signals. We don't have shutdown times yet for the Albany market, and only a few for New York City, where Fox's WNYW (Channel 5) and WWOR (Channel 9) and Telemundo's WNJU (Channel 47) will stick it out right up to the stroke of midnight Friday night, while WABC (Channel 7) goes off at 12:30 PM Friday. NBC's WNBC (Channel 4) and public stations WNET (Channel 13) and WLIW (Channel 21) will sign off at some point Friday afternoon. *RHODE ISLAND's ABC affiliate has lost several of its most popular syndicated shows. Global Broadcasting's WLNE (Channel 6) announced Friday that the station has "suspended its programming agreement with King World," removing "Dr. Phil," "Entertainment Tonight" and "Inside Edition" from the station - but we hear that the suspension actually came from the King World end, as WLNE's ongoing financial struggles have reportedly rendered the station unable to keep paying for the shows. In place of "Dr. Phil" at 5, WLNE will carry "Cristina's Court" and "Family Court," while "ET" and "Inside Edition" at 7 and 7:30 will be replaced by a new 7 PM local newscast, the market's first, followed by "Who Wants to be a Millionaire?" at 7:30. *Former WHDH-TV (Channel 7) anchor Randy Price returns to the eastern MASSACHUSETTS TV airwaves today - across town at WCVB (Channel 5), where he takes over from David Brown as anchor of the station's morning "EyeOpener" newscast. Brown will stay with WCVB as a reporter and fill-in anchor, and he'll be doing some weather forecasting and reporting as well, returning to his original role there. Here's a healthy price for an FM translator: Kingdom Church Inc. is paying Horizon Christian Fellowship $70,000 for W244CF (96.7 Plymouth). Kingdom recently bought Brockton's WMSX (1410), and we suspect W244CF will be making a move in that direction (presumably on a different frequency) before long. 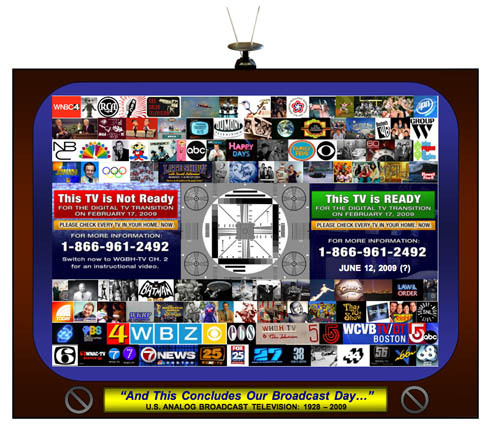 DTV Status Update: Three Boston VHF stations - WGBH (Channel 2), WBZ (Channel 4) and WCVB (Channel 5) - will apparently all be staying on with a "nightlight" loop after ending regular analog programming around noon on Friday. WBZ's sister station WSBK (Channel 38) will also end its analog existence during the noon hour. That leaves WHDH (Channel 7)/WLVI (Channel 56), WUNI (Channel 27)/WUTF (Channel 66) and New Hampshire's WMUR (Channel 9) on the air in analog up until a second before midnight, though we wonder if channels 7 and 9 might go a little earlier to make sure their flash-cuts to on-channel digital operation go smoothly. Out west, Springfield is already digital-only. *Alfred Alonso and Charles Hecht have sold their about-to-expire AM construction permit in the Burlington, VERMONT market. The CP due to expire in August for WVVT (670 Essex Junction) called for 50 kW days, 20 kW critical hours and 300 watts at night from the WCAT (1390 Burlington) towers in the city's Intervale neighborhood, but WVVT also has a pending application to move south to the Albany, New York market, running 15 kW by day and 260 watts at night from a new city of license of East Greenbush, NY. The new permittees, Hilda Gallant and Paul Salas of West Caldwell, New Jersey, will pay Hecht and Alonso just $1 for the CP, and because they qualify for "small business" status they'll get an extra 18 months - until January 11 - to see if they can get the new station built and on the air. *There's a new signal coming to southern NEW HAMPSHIRE: UMass Boston's WUMB-FM (91.9 Boston) has been granted a construction permit for 88.7 in Milford, where it will run 240 watts DA/259' from a site near Wilton. *In MAINE, Terry Cole is leaving his post as general manager of Sinclair's Portland CBS affiliate, WGME (Channel 13), to take the same job with Sinclair's pair of stations in Pensacola, Florida, where he'll oversee ABC affiliate WEAR (Channel 3) and My Network affiliate WFGX (Channel 35). No replacement has been named yet at WGME. DTV Status Update: The transition is already well underway in the Pine Tree State, where all of the MPBN public TV stations have already gone digital-only, as have Bangor ABC affiliate WVII (Channel 7) and all but two Portland stations - NBC affiliate WCSH (Channel 6) and ABC affiliate WMTW (Channel 8). *Retro TV, formerly known as RTN, is getting a toehold in the New York TV market, thanks to a heretofore-obscure CONNECTICUT-based UHF station. Multicultural Broadcasting's WSAH-DT (Channel 43/RF42) in Bridgeport will pick up RTV's programming effective July 1. 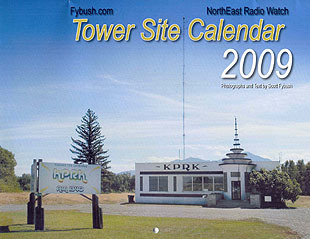 The station has a pending application to move its digital transmitter from Seymour, Connecticut to the Empire State Building. DTV Status Update: Most of the Hartford-New Haven market remains on the air in analog right up to Friday; no word yet on signoff times for those stations. The supply is dwindling fast at our clearance price of just $9 each, postpaid - that's half-off the usual price of $18. So place that order now - and get ready for pre-orders of the 2010 edition, starting in July. *A call change in NEW JERSEY: the former WXKW (97.3 Millville) has become WENJ-FM, now that it's sharing ESPN Radio programming with sister station WENJ (1450 Atlantic City). Moving north, Matt Knight has been promoted from assistant PD to PD at "Hits 106" (WHTG-FM 106.3 Eatontown/WBBO 106.5 Bass River Township), where he's been part of the station's staff since its debut. *In western PENNSYLVANIA, a Pittsburgh morning show is adding a night shift: morning hosts John Cline and Kerri Griffith will be doing 7-10 PM on WLTJ (92.9), tracking new material that will air on what's being called "The Q Morning Show: PM." A call change west of Scranton: WEMR (1460 Tunkhannock) has dropped the only calls it's ever had (they stood for "Endless Mountains Radio") to become WGMF, matching sister station WGMF-FM (107.7), which has changed city of license from Tunkhannock to Dallas. And a new station will come to the airwaves in the Altoona area this week: Radio Maria is preparing to turn on WHHN (88.1 Hollidaysburg), which will relay its Louisiana-based Catholic programming. DTV Status Update: The Erie market goes all-digital today, when the last remaining analog station, WICU (Channel 12), pulls the plug to get ready to get its new channel 12 digital signal up and running by Friday. The Wilkes-Barre/Scranton market has also been chugging along with just one analog signal since February, and WNEP (Channel 16) will finally get to turn off that analog transmitter Friday. Most of the analog signals in the Philadelphia and Harrisburg markets are staying on through Friday night; we'll post exact shutdown times as we find them, so stay tuned for an update later this week. Johnstown and Altoona are down to just two remaining analogs - WJAC (6) and WTAJ (10), and they'll be gone sometime Friday. In Pittsburgh, KDKA (2), WTAE (4), WPXI (11) and WPCW (19) are the only analogs left, and PBRTV.com reports they'll all stay on right up to midnight Friday, when channels 2 and 4 will go to nightlight service and WPCW-DT will sign on on channel 11. *Friday afternoon brought a high-profile format change in CANADA's biggest market: just one day past the sixth anniversary of its 2003 flip from "Kiss" to "Jack FM," CJAQ (92.5 Toronto) returned to its old "Kiss" branding and top-40 format at the stroke of 3 PM. At its end, Toronto's "Jack" had evolved significantly from the early days of the adult hits format, with live jocks in most dayparts and a musical lean toward classic rock. The new "Kiss" is apparently launching jockless, but a new talent roster for the Rogers station is expected to be announced soon. *The CRTC has completed its review of more than a dozen applications for new FM signals in Ontario's "Cottage Country," and it's decided to grant a new station in Orillia, but not in the Bracebridge/Gravenhurst area. In Orillia, seven applicants wanted new stations on 89.1, and the winner was Owen Sound-based Bayshore Broadcasting, which gets a 2100-watt signal that it will program with an AC format as "Sunshine 89.1." Bayshore was one of a half-dozen applicants for either 101.7 or 102.3 in Bracebridge or Gravenhurst, but the CRTC decided that small market can't sustain a competitor to Halliburton's CFBG. The CRTC did grant licenses for new low-power travelers information stations in both areas: Jack McGaw's Instant Information Systems gets 101.9 in Gravenhurst (to be CIIG) and 98.5 in Orillia (CIOA). While we're running down new calls, Dan Sys' Canadian Radio News reports that My Broadcasting's new 100.9 in Brighton, Ontario will be CIYM, Five Amigos' new 99.1 in Wallaceburg, Ontario will be CKWD and the new 100.7 in Bridgewater, Nova Scotia will be CJHK. The Cottage Country applications also included one for a power increase at CFBK (105.5 Huntsville), which gets to go from 5 kW to 43.4 kW. *Why did Rob Farina leave his position as VP/programming for CTVglobemedia's CHUM Radio group? Turns out his new position with competitor Astral Media is VP/GM of the group's Toronto cluster, the job last held by Pat Holiday. Along with Farina's arrival, there are some other leadership changes at the group: Martin Tremblay moves from PD of CJEZ (EZ Rock 97.3) to CKFM (Virgin Radio 99.9), opening a hole for a new PD at CJEZ. In Hamilton, they're remembering Randy Steele, whose feature reports were a highlight of the newscasts on CHCH-TV (Channel 11) beginning in 1995. Steele succumbed to throat cancer May 22 after a long battle; he was 47. *And finally this week...we can't leave you without a few words about the sudden demise of Radio & Records, the bible of the industry for much of its 36-year existence. But for anyone who puts any value at all on accurate, intelligently-reported news about what's left of the broadcasting industry, the loss of R&R is still an unfortunate blow. As the business struggles to reinvent itself, it needs all the sources of information it can get - and that means that those information sources (present company included) need all the support they can get from readers and advertisers to stay afloat. CANADA's second-largest market is about to lose its second-largest English-language commercial news-talk station. Corus' CINW (940 Montreal) has failed to make a dent in the ratings pretty much from its first day on the air back in 1999, when the former CIQC (600) relocated up the dial to the frequency formerly occupied by the CBC's CBM. The station launched as an all-news outlet, "940 News," in parallel to French-language CINF (690), but while the vibrant Francophone market supported an all-news entrant, Montreal's declining Anglo population remained locked to Standard's CJAD (800) and to the CBC. Even after the all-news format gave way to a mix of news and talk as "940 Montreal," ratings and revenues failed to improve, and late on Friday Corus Quebec VP Mario Cecchini took to the airwaves to announce that, effective June 14, CINW will flip to oldies as "AM 940 - Montreal's Greatest Hits." The move will put 18 people out of work at Corus. There's a format change of sorts in NEW JERSEY: As of Friday, Equity Communications has flipped its rhythmic top 40 "Buzz" WZBZ (99.3 Pleasantville)/WSNQ (105.5 Cape May Court House) to mainstream top 40 as "99.3 Kiss FM." What gives? With Paul Kelly having just departed as PD of Equity's hot-AC-verging-on-mainstream-top-40 WAYV (95.1 Atlantic City), there's speculation that Equity is trying to block Kelly from launching an all-out top-40 war at his new home as one of the partners in the Atlantic group that's buying the former Access.1 stations in the market. In MAINE, WGAN (560) lost morning show co-host Mike McCardell on Friday night (June 4). McCardell, a devoted Civil War buff, was attending a battle re-enactment in Pennsylvania when he suffered a fatal heart attack. McCardell came to WGAN's attention four years ago, when he was working as a salesman and calling in on a regular basis to the station's morning show. When WGAN needed a new host to replace Willy Ritch, they tapped McCardell based on his engaging call-ins, and he quickly became a fixture on the morning show, first with Jim Crocker and more recently with Ken Altschuler. He was just 52, and leaves behind a wife and two daughters. PENNSYLVANIA lost one of its legendary rock DJs on Friday as well, when Joe Niagara lost his battle with bladder cancer at the age of 76. Niagara was on WIBG (990 Philadelphia) in the mid-fifties when he became one of the first jocks to play rock and roll for a mass audience. The "Rockin' Bird" stayed with WIBG until 1959, later working at WFIL, WCAU, WCAU-FM, WIFI and WDAS. In 1977, he joined the staff of WPEN (950), where he remained until his retirement in 1999 (and continued doing some guest DJ appearances as late as 2002.) Niagara made it into the Guinness Book of World Records in 1980 for playing the most consecutive versions of "Stardust" on WPEN - more than 500! In RHODE ISLAND, WADK (1540 Newport) is trying again to get night power. The FCC dismissed its application for 20 kilowatts at night last month, saying it contained unacceptable overlap with WDCD (1540 Albany) and KXEL (1540 Waterloo IA), and now WADK has amended the application to call for 5 kilowatts from three towers (including the one tower now used for WADK's one kilowatt of day power.) At 5 kW of night power, WADK won't even cover all of the city of Newport with its nighttime interference-free signal - it takes a whopping 95 mV/m of signal to overcome the huge signal that WDCD throws at Rhode Island. The fallout from Mel Karmazin's departure at Infinity Radio is being felt in MASSACHUSETTS, where WBCN (104.1 Boston) PD Oedipus announced last week that he's leaving his job after an amazing 22-year run. Oedipus came to Boston in 1975 as a DJ at MIT's WTBS (88.1), moved over to WBCN as a part-time DJ in 1977, and four years later was programming the station. After seeing WBCN through the long ride from progressive rocker to establishment album rocker to modern rock, Oedipus will finally hand over the reins (though no replacement has been announced yet.) He'll stay on as Infinity's VP/alternative programming. Just a month after the CBC turned off its AM transmitter in Montreal, the end is nigh for CBL (740) in Toronto. IRCA's AM DX Newsflash reports the CBC will shut down the AM transmitter Saturday, June 19, 14 months after replacement FM transmitter CBLA (99.1) was activated. As with the shutdown of CBM in Montreal, the end of CBL will deprive many US communities of CBC service. While Buffalo and Niagara Falls can hear CBLA and its Crystal Beach relay transmitter at 90.5, the FM signals are blocked by co-channel and adjacent-channel US stations across the rest of Western and Central New York, areas where CBL has been nearly a local station for now. NERW will sorely miss the intelligence, humor, and international perspective a CBC outlet can bring to an otherwise mega-opoly plagued radio dial like Rochester's. We're waiting to see what the CRTC does with the 740 frequency. Unlike Montreal's 690 and 940, which had several applicants lined up even before CBF and CBM went silent, no application window for 740 has been opened yet. We plan to head north in the NERW-mobile to hear the end of CBL in a few weeks. If all goes according to precedent, programming on Friday, June 18 will be interrupted every ten minutes by announcements telling listeners to move to FM. At midnight, programming will be replaced with a repeating ten-second loop, with the transmitter going dead for good 24 hours later. Congratulations to Steve LeVeille, who's been named to succeed Bob Raleigh as midnight-5 AM host on WBZ (1030 Boston). The LeVeille Broadcast will be heard Sunday through Thursday nights (or is that Monday through Friday mornings?) beginning next week. No word yet on who'll fill the other big talk opening at WBZ, the 10-midnight slot being opened by David Brudnoy's decision to cut back his hours on the air. As for LeVeille's current Friday night overnight spot, NERW hears Jordan Rich is likely to add that overnight to the rest of his 'BZ weekend duties. LeVeille says the new weekday "Broadcast" will be more issue-oriented than the Friday-night version, but he promises "a very different approach" from other talk hosts -- a promise NERW's sure he'll live up to. In CONNECTICUT, there are all sorts of changes to report in and around New Haven, and we'll start on the radio side, where much of the local programming on WAVZ (1300) is being pulled by corporate owner Clear Channel in an attempt to make room in the budget to add Rush Limbaugh to sister station WELI (960). Among the victims of the budget axe is Ron Rohmer, 68, who has spent more than four decades at WAVZ and WELI. He was fired from WELI a few years ago, sued Clear Channel, and ended up coming back to the stations as WAVZ morning host -- at least until this week, when the New Haven Register reports he was fired by PD Jerry Kristafer. Also out the door at Radio Towers Park is WELI mid-morning co-host Roger Vann, who resigned Wednesday rather than let the station cut his salary and that of co-host Tom Scott. Scott was only a part-time employee, and tells the Register he wants to pursue syndication opportunities with Clear Channel. Rohmer's WAVZ morning show will be replaced with satellite programming, while Limbaugh will start June 14 on WELI, pushing Dr. Laura Schlessinger's program to 3-6 PM, displacing afternoon host Tad Baldwin, whose future with WELI is uncertain.